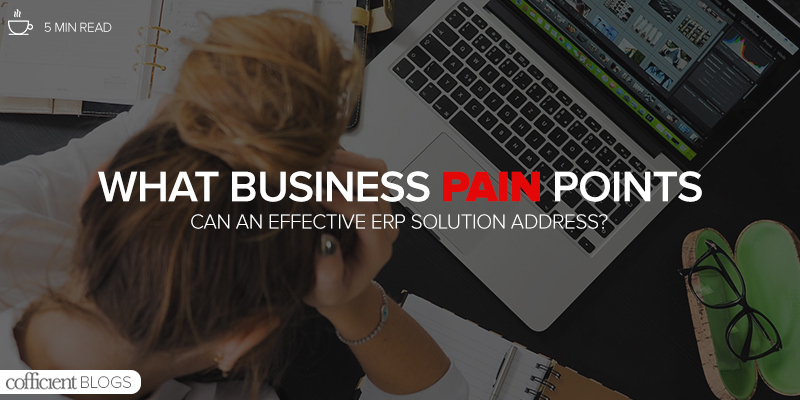 What Business Pain Points Can an Effective ERP Solution Address? There are a couple of factors that might push a company to consider a rethink of its management and reporting resources. First — and this is typically something that sits outside of an individual business’s control — is the increasing pace of change in the competitive environment. Agile, often aggressive disruptive forces in the market as well as a broader move toward digitisation are shaking up whole industry sectors. Incumbents are under threat of being unseated, with four in 10 current market leaders expected to be displaced by digital disruption within the next five years. This is arguably as much a result of inaction or a wait-and-see approach to digital disruption as it is of an unstoppable market force. But the fact remains that times are changing, and faster than ever before. It also presents an opportunity to new challengers. Second, as businesses grow to new levels of size, complexity, and performance obligations and as their client base becomes broader and more demanding, it simultaneously becomes more difficult and more important to be able to plan and manage available resources. This will particularly be the case for businesses — typically small and midsize enterprises — that are scaling at speed. And it becomes even more acute when entering the territory of possible merger and acquisition decisions or international expansions, which inevitably places a new and greater strain on organisational resources. Each of these things will throw up its own pain points, particularly for smaller companies that might not have resources dedicated strictly to the operational side of a business. One potentially tricky area for a business growing at pace is getting the books balanced on time, especially if this process involves working with multiple currencies or localised legal requirements, including taxes. As systems for managing processes like profit and loss accounting, cash position reporting, or tying financial results to inventory evolve over time, it can begin to feel like things are getting out of control. And this can be something of a make-or-break moment for growing businesses: there comes a point when juggling an increasingly tangled mess of work streams and siloed responsibilities will not only stifle an organisation’s expansion, but also threaten its existence entirely as the cogs become jammed and stop turning. When you add to all of this the challenges posed by a lack of data-driven insight when it comes to making important decisions, or outdated, time-sapping manual processes, or new requirements that stretch the capabilities of existing IT solutions and tools, the pressures only become greater. What’s more, as problems mount so do the demands on employees trying to spin plates and put out fires — all while trying to push the business forward and keep it growing. Increasingly, people have come to expect a degree of simplicity from the tools and technology they use both at home and at work. And if the solutions you have in place to help people get the job done are themselves becoming a burden, then something needs to change. Ultimately, what’s needed at this stage is a single point of truth, something to bring together the various pockets of information that have been, until now, created and managed independently. For managers to be able to understand and guide operations within a company, they need a clear view of everything that’s going on. Having the ability to coordinate and align multiple information streams in a way that’s compatible with the growth of the company is vital. It’s exactly this kind of challenge that enterprise resource planning (ERP) solutions have been designed to meet. Streamlining processes in this manner is the simplest way to reduce unnecessary duplication when it comes to managing the information that keeps a business ticking over. It also provides a degree of transparency for organisations, allowing managers to identify redundant workflows and make data-driven decisions based on the reality of what the business needs. And, crucially from an IT perspective, it can work from the cloud, providing quarterly software updates so that businesses always have access to the latest innovations, as well as flexibility in terms of cost, service, and usage, consigning major and expensive upgrade projects to history. This allows small and midsize enterprises to maintain the agility and speed of growth that keeps them competitive. No matter what the market is dictating.